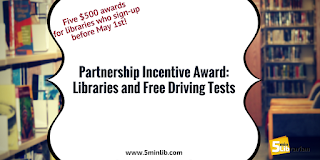 Does your library offer free driving tests (car, motorcycle, and commercial) to your patrons? 1. Elegant E-Learning offers a free online driver's ed to libraries and their patrons. It is also ad-free and really easy to setup, with a special URL with your library's name. They do not keep information and there is no authentication needed. Best of all - these driving tests not only help teens and new drivers with preparing for their first driver's license, but they also provide tests for motorcycles and commercial vehicles. So many patrons can benefit from this! 2. 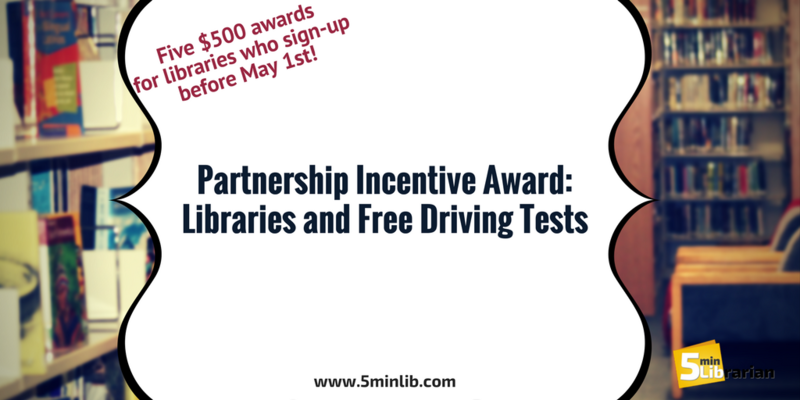 And, from now until May 1st, 2017, every library who signs up will be automatically added into a $500 drawing. Five lucky libraries (and that's public, school, and academic libraries) will be selected. So, if there is anything you do today, why not check out their website and sign-up? In May, you might be really thankful that you did this. Full disclosure: I should mention that a few months ago, Elegant E-Learning's founder, Andrei Zakhareuski, contacted me and asked for ideas on how he can reach more libraries. We had a great conversation and the $500 drawing was one of the ideas that came out of it. (Thanks to my background with trying to get teens to participate in programs.) I really hope this idea helps many libraries participate! If you were always meaning to add this to your website, now is the time to do it. This is Andrei, the founder of Elegant E-Learning. Jess, thank you so much for your fantastic advice during these past few months and for your post today! Our non-profit division chose to support libraries because we’ve personally seen how vital they are. (My mom still tells stories about how every librarian in the town I grew up in knew me by name.) Today, with libraries getting less funding every year, we wanted to do something – even a little thing – that can help libraries get more patrons and attention even as their publicity budgets shrink. Our desire to help gave rise to this partnership program, and we're super excited to be working with over 1,700 US libraries on it. Andrei, thank you for commenting. We really appreciate your support. Every little bit does help. Andrei, as a public librarian I wanted to thank you for your support! It's so nice to be able to offer a new service to my patrons! DonnaS, thank you for using the program!